Action motorsport has a new home in 2018 with the launch of the New Zealand Xtreme Motorsport Series (NZXMS) set to host four dynamic racing disciplines. Officially, the four series will be known as the National Rally X Series, National UTV Series, NZ SuperMoto Cup, and the longstanding D1NZ National Drifting Championship, which retains its name for 2018. The move to an expanded roster is spearheaded by NZXMS Managing Director Brendon White, who last year began shifting the D1NZ series in a new direction alongside its venues. The 2016–’17 D1NZ season saw a number of firsts as the series brought drifting to Dunedin’s Forsyth Barr Stadium and took it inside ASB Baypark Stadium in Tauranga. In Dunedin it was the first time a drift circuit had been built inside an enclosed stadium in the Southern Hemisphere. Only a few months later D1NZ paved the inside of the Baypark Speedway—another first for the series. White said last year’s efforts towards building custom circuits showed New Zealand motor racing fans what was possible. Now he wants to take it to the next level with the introduction of a new racing discipline for the country; rally cross. “Last year was really a year of learning for us,” White said. “It wasn’t a cheap exercise, but we discovered a lot of things we wouldn’t have thought were possible, like draining the inside of a flooded stadium then filling it with concrete a day later. 2018 will see several major changes to the calendar and circuit construction. Like last season, NZXMS are will undertake two fully custom track builds. The first of which will take place at Wellington Family Speedway in Upper Hutt. Half of the new track surface will remain permanent in the two year strategy of having a permanent venue for the region. The addition of Timaru to the calendar will also be a major coup for the South Island, with all four series set to feature. It also means the rally cross element will be added to the Levels Raceway facility, a never-before-seen style of racing for the circuit. With the addition of the National Rally X Series, an all new innovative track design will combine a concreted track surface and a dirt arena outside of the stadium. Joining the action for the first round will be the NZ SuperMoto Cup and National UTV Series too. 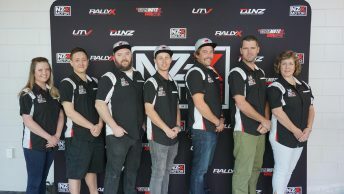 As well as the addition of the new series to the roster are new members of the NZXMS team. Joining White will be and Marketing Manager Peter Ruthven, Events Coordinator Shona Smith and Marketing Coordinator Kenny Ruddell, and Media Manager Simon Chapman. The new series is structured as a group shareholding company where interested parties can invest into the business and sport moving forward. “We are currently looking at our next funding phase for 2019 to grow more venues nationwide which is a positive and exciting move for NZ Motorsport,” incoming Director Alex Griffin said. White said the addition the four classes on the same weekend for the first time will make for a busy and varied schedule for every motor racing fan. “This year we’ve got new and returning members to build a new robust management team that will continue to work with major stakeholders in New Zealand motorsport. The opening round of the New Zealand Xtreme Motorsport Series kicks off at Max Motors Family Speedway in Wellington over January 12-13, featuring drifting, rallycross, supermoto and UTV racing.